Welcome by, friends! 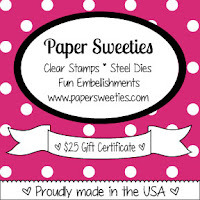 Today is a FABULOUS day because it's Release Day at Paper Sweeties, and that means YOU can now purchase these amazing new sets. 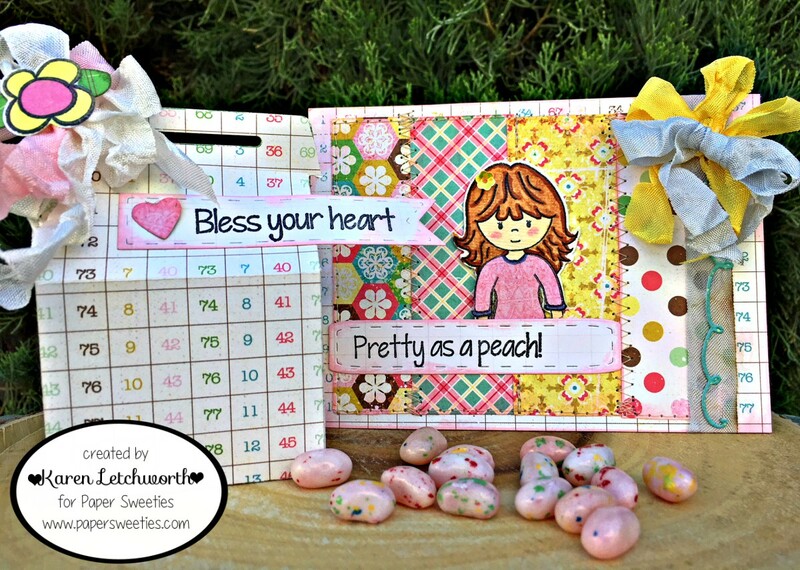 There's an AWESOME new sentiment set called Hey Y'all Stamp Set which includes ten darling sentiments, and there's a super cute new treat box die called Treat Box Sweet Cut. I used both of these wonderful new sets on my projects for today. Just look how CUTE they are! The Treat Box Sweet Cut is a die that, when cut twice, can be folded into this ADORABLE little treat box to hold candies, a gift card, etc. As you can see, it's easy to decorate, too! I tied a pretty bow using Bubblegum Seam Binding and Frosting Seam Binding. This Seam Binding is SO crinkly and luscious...I love it in every color! I topped the bow with a sweet flower and two leaves that were stamped using the A Friend Is Stamp Set and cut with the coordinating A Friend Is Sweet Cuts. I also cut a banner using the Sweet Borders Sweet Cuts and stamped the sentiment "Bless Your Heart" using the new Hey Y'all Stamp Set. 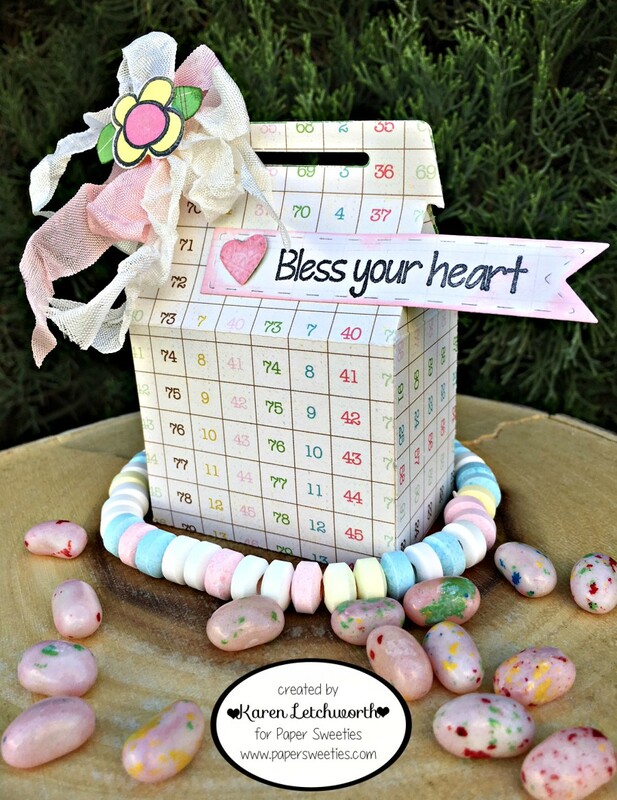 I filled this little Treat Box with a candy necklace and some yummy Bubblegum Jelly Bellies. This new Treat Box Sweet Cut is AWESOME for making special treats to give to someone special. I also made a matching card using this adorable new Hey Y'all Stamp Set. 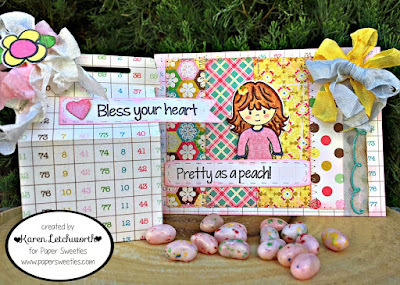 This sentiment (Pretty As A Peach) is also one of the ten adorable sentiments found in this new set. I simply cut and inked some paper strips, and I machine stitched them in place. Next, I added a length of Blueberry Seam Binding, and I used that along with a piece of Cookie Dough Seam Binding to create a bow. Along the Seam Binding, I placed a swirly turquoise banner that's cut a banner using the Sweet Borders Sweet Cuts and I used the Sweet Borders Sweet Cuts again to cut the sentiment banner you see. On that banner, I stamped yet ANOTHER darling sentiment from the new Hey Y'all Stamp Set. Just above the sentiment banner, you will see my sweet friend, Madison, peeking through. I stamped Madison, and cut her with the Madison Sweet Cut. Her little outfit was stamped using the super sweet and "Springy" Live Love Grow Stamp Set....one of SO many cute stamp sets found at Paper Sweeties. I placed a Cookie Dough Sequin in her hair. Below you'll find the complete list of all my super talented friends at Paper Sweeties who have prepared something to inspire you today. 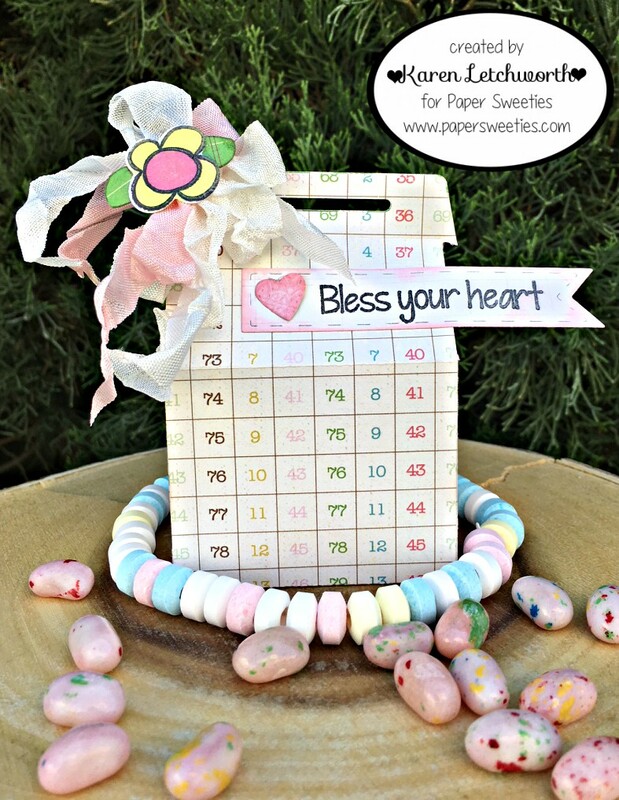 Just click on each of their names, and you'll be taken directly to their Paper Sweeties Blog Post for today. Thanks again for stopping by, and don't forget that as of today, you can purchase these fabulous new sets at Paper Sweeties. Addicted To Stamps Challenge Blog - Challenge #164 - Ribbons Galore - I used lots of fabulous seam binding to create my bows. I also did lots of fabulous stamping. 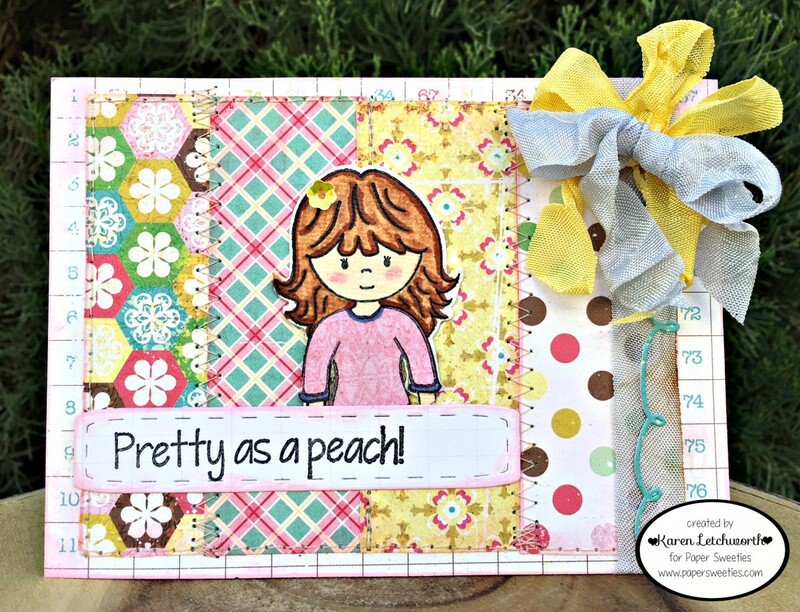 CropStop Challenge Blog - May Linky Party #39 - Anything Goes - I used lots of fabulous Tim Holtz inks. Oh Karen what a beautiful wee gift box, made all the more perfect with it's matching card. Very sweet card with Madison and treat box! 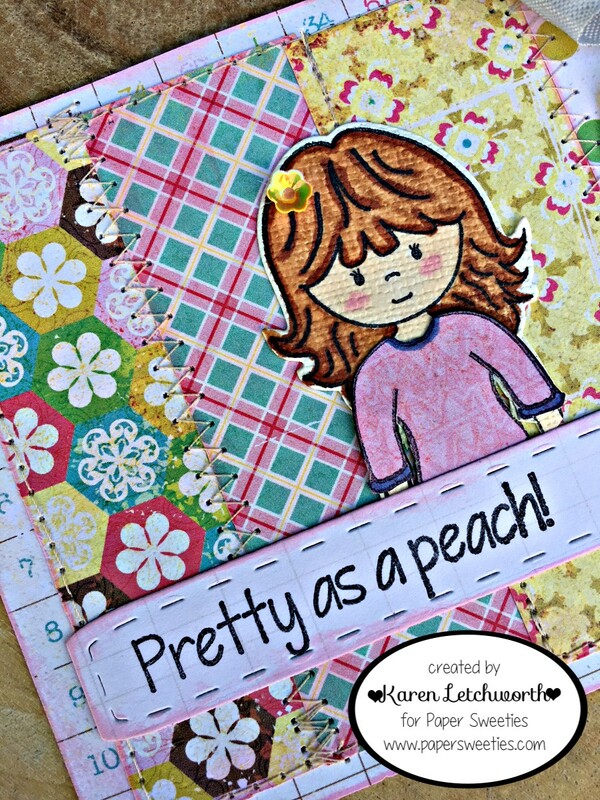 Great design with the patterned papers! And, great touch with the stitching! Very pretty bow treatment, too! Thanks so much for your sweet comments on my blog! Super cute creations! I love the treat box and that card is so beautiful with it's stitched background! So happy you linked up to Cropstop with this! What a fun box and a super cute card. I love those papers! Thanks for participating with CraftyHazelnut’s Patterned Paper challenge!